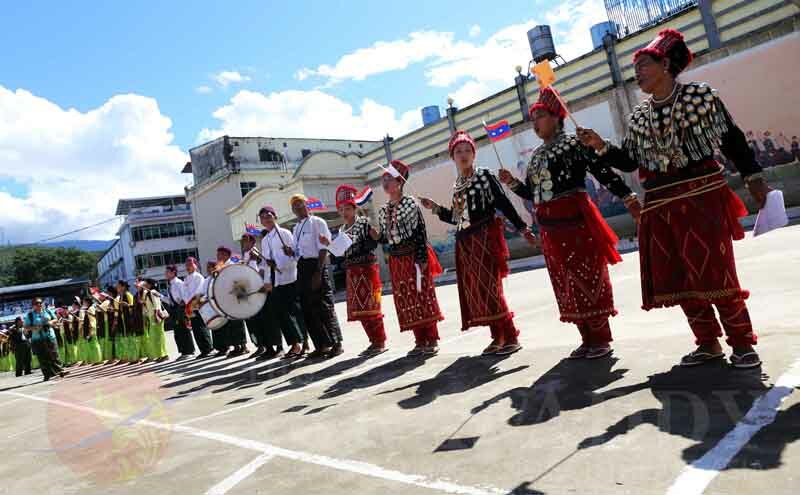 LAIZA, Kachin State — Hundreds of people, from the elderly to schoolchildren, many wearing traditional ethnic dress, flooded into the streets Tuesday to greet leaders of Burma’s ethnic armed groups arriving for a conference to discuss upcoming ceasefire negotiations. More than 20 vehicles traveled from the Kachin capital of Myitkyina to Laiza, the headquarters of the Kachin Independence Organization (KIO) on the Sino-Burmese border, for three days of talks starting Wednesday. They carried leaders of ethnic armed groups including the Karen National Union (KNU), Shan State Army-South (SSA-South), Democratic Karen Benevolent Army (DKBA) and representatives from other ethnic armed groups, as well as leaders of the ethnic alliance the United Nationalities Federal Council (UNFC). 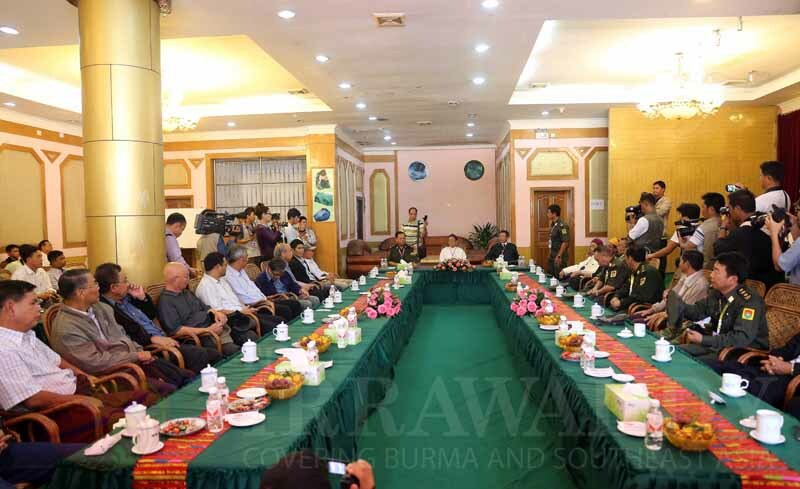 According to ethnic sources, following the conference the ethnic groups will return to Myitkyina and hold another meeting with a Burmese government delegation led by Minister Aung Min there from Nov. 4 to 5. Along the road into Laiza, several villages were seen empty and some houses were almost overgrown by bushes. Villagers have abandoned their homes during fighting between the government and the Kachin rebels that broke out in June 2011 and are now taking refuge in camps in Myitkyina. Several women living in an internally displaced persons camp in Myitkyina told The Irrawaddy they want to return to their villages, but do not yet feel safe to do so. Abandoned villages along the road to Laiza were occupied by the government troops. 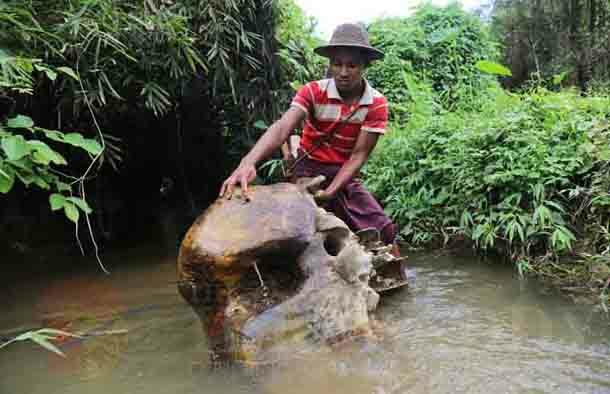 More than 10 military camps and checkpoints are positioned along the road from Myitkyina to Laiza. Local people and merchants said the military officials at the checkpoints often question, tax or extort money from travelers. As the ethnic leaders travel for Laiza for peace talk, government troops reportedly launched attacks against the KIO’s military wing, Kachin Independence Army (KIA), in Mansi Township in Bhamo District. Present at the talks will be KNU chairman Saw Mutu Say Poe, Col Sai Lao Hseng of SSA-South, Nai Hong Sa, general secretary of the UNFC and Harn Yawnghwe, executive director of Brussels-based Euro-Burma Office. The ethnic armed group leaders will discuss the nationwide ceasefire accord, which the government’s peace delegation wants all groups to sign in late November. Ethnic leaders said that the Laiza meeting is important for the future of the ethnic armed groups, with some said termed the goal of the talks as a significant “Laiza Agreement” between the groups. The Panglong Agreement is a historic agreement signed in 1947 in Panglong town in Shan State by ethnic Shan, Kachin and Chin with a central Burmese government delegation led by late Gen Aung San. Observers said that the Laiza conference is vital as any decision from the meeting will decide the future of the ethnic armed groups. It is believed the ethnic leaders will negotiate to form one voice before meeting with the government peace delegation and to discuss whether or not sign the nationwide ceasefire agreement.